You won't find a more festive month in Colombia than December. Everyone here prepares weeks in advance for Christmas and the New Year, with seemingly non-stop parties and celebrations leading up to the big day. Higher lodging and airfare prices are to be expected, as is great weather throughout the country—even famously rainy Bogotá stays mostly dry this month. The good thing about Colombia is that, because the country is so close to the equator, there is little fluctuation in weather throughout the year. Therefore, how hot or cold a particular region of the country will typically depend on its altitude. Colombia's coastal areas will always be hot and humid, with the Caribbean lowlands averaging 86°F. Medellín and other towns and cities in Antioquia Department enjoy a perpetual springlike climate (even in December), and the southern city of Cali is similar, with average lows of 65°F. You can expect the central Andes and Bogotá to be cold and rainy throughout the year, with temps averaging around 66°F. Having said that, you're in luck—April-October is considered the rainy season in the capital city, and December-February is regarded as the best time to visit. Colombia has many high travel seasons throughout the year, and these often coincide with holidays and festivals. December is no different, as the entire country seems to be preparing all month for Christmas. Mid-December is when most Colombians start their vacation, so know that if you arrive during this month you won't just be contending with foreign tourists but local vacationers as well. You won't be paying more for meals during this time (although reservations at nicer restaurants might be tougher to book), but expect steep price increases for flights and hotels. Know that in the more touristic cities (Cartagena in particular) many hotels enforce a minimum stay of 3-4 nights during the holiday season. Because it's the dry season in Bogotá, travelers who find themselves in the capital can take advantage of the sunnier skies and spend more time outside. If you're escaping winter back home, you might prefer a tropical Christmas somewhere along the Caribbean, like Cartagena, Santa Marta, or even Isla San Andrés, whose beaches and mar de siete colores ("sea of seven colors") certainly beat those snowed-in driveways back home. Still, no city in Christmas-mad Colombia exudes more festive spirit than Medellín. To visit this city during the month of December is to be lost in a wonderland of street parades and celebrations. Most impressive is that the exterior of seemingly every house is lit up, illuminating the surrounding Andes in vibrant displays of red, green, and gold. If you do happen to be in Bogotá, you need to make a special trip up to Cerro Monserrate. This peak clocks in at over 10,000 feet, and its one of the nation's top tourist draws due to the panoramic views it affords of Bogotá below. 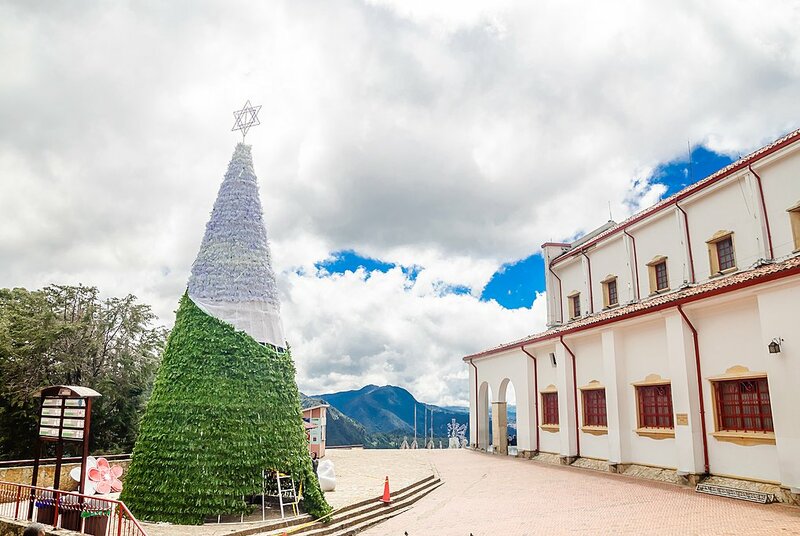 What outsiders may not know is that every year at the beginning of December the peak of Cerro Monserrate comes alive with Christmas lights and decorations. Come up for sunset, when Bogota lights up from below while you're awash in Christmas colors from above. Also be sure to travel a few hours north to Villa de Leyva, located in Boyacá Department. No one kicks off Christmas season in Colombia quite as raucously as this colonial gem of a town (more on this below). Festival de Luces. On the 7th, 8th, and 9th of December, Villa de Leyva’s sprawling central square is lit up with fireworks in order to celebrate the impending Christmas holiday. Feria de Cali. From the 25th to 30th of December, Cali reminds the world why it’s synonymous with salsa. There are live music concerts, Paso Fino horse parades, revelry, and, of course, much dancing. Traveling to Colombia in December? Check out these great itinerary ideas. December Holiday Adventure in Colombia. This fun and festive 7-day Latin American adventure starts in Medellín, a city that goes bonkers with Christmas lights. From here, you'll head to lakeside Guatapé for hiking, visit a coffee farm, and then fly to Cartagena—a fairy-tale city that draws an international crowd. Bogotá & Zona Cafetera. Discover Bogota's neighborhoods, museums, and other offerings before flying into the Zona Cafetera to spend the night at a working coffee farm. Next visit nearby Salento, a colonial/Antioquian town that wears its colorful exuberance on its sleeve. While here, hike the unspoiled green mountains of the Cocora Valley.